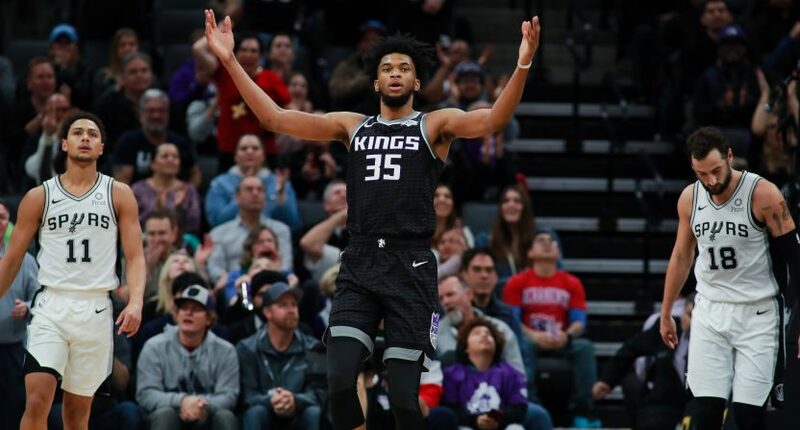 Sacramento Kings rookie big man Marvin Bagley III is starting to really make strides and show why he was the No. 2 overall pick in the 2018 NBA Draft. The Duke product scored 24 points, pulled down 12 rebounds, dished out four assists, and added three blocks in the Kings’ 127-112 victory over the San Antonio Spurs on Monday night. Marvin Bagley finishes his career night with 24 pts, 12 rebs, 4 asts and 3 blks. Last rookie to do that was Lamar Odom in 2000. Last teenager to do that was … no one in NBA history. That’s some crazy athleticism from a 6’11” human. The 24 points are the most Bagley has scored in a game so far in his 39-game career, and he now has at least 12 rebounds in three straight games. All three of those games have also been Kings wins, and they’re now three games over .500 at 28-25. That’s nothing short of stunning when you consider Sacramento entered the season with an Over/Under win total set at 25.5 games by the oddsmakers. damn Kings closed with a 25.5 win total before the season. they're now 28-25. Fun story. And with the way Bagley is improving, this Kings team may just be getting better in the 2018-19 campaign. They’re currently just a half game behind the Los Angeles Clippers for the eighth seed in the Western Conference.